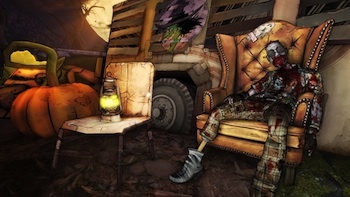 The next wave of Borderlands 2 DLC kicks off next week. Just when you were done with Borderlands 2... It's pulling you right back in! TK Baha's Bloody Harvest, yet another DLC pack, will hit PSN, XBLA, PC and Mac October 22, 2K Games announced on its blog. The mission-based DLC will add new locations, enemies, and quests. Bloody Harvest will be the first of at least three "Headhunter" DLC packs. The Headhunter packs will include new missions, culminating in tough fights against "unique bosses." The Headhunters missions can be played "sitting either by yourself, or with friends," and will cost $2.99 each. In TK Baha's Bloody Harvest, the vault hunters will take orders from the zombified corpse of former ally TK Baha, who sends them on missions to collect the pieces of the key to the Pumpkin Kingpin's Pumpkin Patch. All the while, your enemies will drop "augmented candies" that add temporary stat boosts, including increased speed and damage.